Birmingham Royal Ballet (BRB) has a vault of old favourites it dusts off every few years as the company knows they are sure-fire crowd-pleasers. Among them is the endearing 'Still Life' at the Penguin Cafe short dance, which is at the heart of its new triple bill for the Autumn Season. The Penguin Cafe Programme 1 - also featuring two other dance productions Concerto and Elite Syncopations - opened at Birmingham Hippodrome on September 27, where it stays until September 30. 'Still Life' at the Penguin Cafe then moves on to Sadler's Wells theatre in London as part of a triple bill with Arcadia and Le Baiser de la fee on November 3 and 4 for the Penguin Cafe Programme 2. 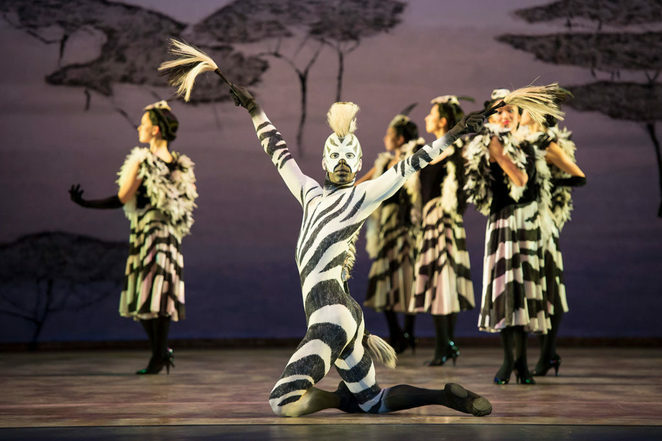 The beauty about the Penguin Cafe production, created masterfully by choreographer David Bintley, is that on one level for children, it's simply a delightful personification of various exotic animals from penguins to zebras and a Brazilian Woolly Monkey with fantastic costumes. On a deeper level, it is also a performance about endangered species and the fate of our planet that resonates long after you have left the theatre. Beautifully choreographed routines bring the animals to life during the 43-minute routine. There's the busy penguin waiters serving guests like the seductive Utah Longhorn Ram, who does a glamorous routine akin to Fred and Ginger with her tuxedo-wearing entourage of men. Dancer Samara Downs dances divinely with Iain Mackay during this romantic section. Yes, a dancing penguin is always going to be a winner, but this witty, engrossing and thought-provoking production is so much more than that as the cheery mood wanes into a more sombre tone for a finale of floods, presumably brought on by climate change. The most moving section actually involves humans rather than animals - the forest people and their child. This exquisite dance is performed emotively by Celine Gittens, Brandon Lawrence and Amber Cook, an impressive Year 7 pupil from Elmhurst Ballet School. The costumes are fantastic, as are the dancers, many of them keeping pinpoint accuracy despite dancing in full head to foot heavy costumes as a morris-dancing flea, a line-dancing rat, penguins and the like. It was nice to see choreographer Ruth Brill dancing back on stage as the chief penguin too. 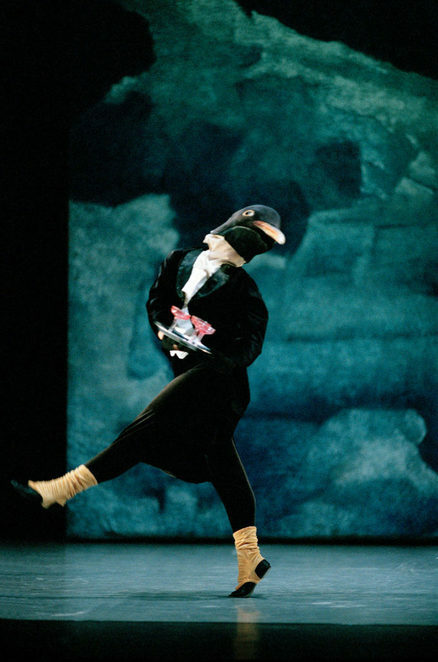 The Penguin Cafe was the second dance in the programme that interceded two memorable works by one of the greatest British choreographers, Sir Kenneth MacMillan. To mark the 25th anniversary since his death, the programme opened with his simple but dramatic piece Concerto and closed with the vibrant jazz-infused work Elite Syncopations. Concerto uses a soundtrack of Shostakovich's Second Piano Concerto to create a dignified, simple production that puts the emphasis on technical precision. Exact lines and balance are beautifully displayed by a cast that included the impressive Jenna Roberts and Tyrone Singleton during the Second Movement. It emphasised just how strong BRB's female principal dancers are at the moment with Roberts, along with Samara Downs and Momoko Hirata, showcasing their accuracy and stamina. Bringing the evening to a close was the playful Elite Syncopations. Accompanied by a band and pianist on stage playing the ragtime music of Scott Joplin, a series of brightly dressed characters take their turns on the dancefloor with vibrant and often humorous escapades. It's a light-hearted piece to conclude with the hilarious, cleverly choreographed pairing of Yvette Knight and Tzu-Chao Chou, who have to be exceptional dancers to pull off such an intentionally awkward and funny pas de deux. The stage may be scant of scenery for this production but the array of bright, skin-tight eccentric costumes make up for it. The Penguin Cafe was always going to overshadow this triple bill as the production is still a joy despite approaching 30 years since its premiere. It's an iconic classic with an environmental message as important today as it was back in 1988. The zebra and penguin costumes are fantastic.